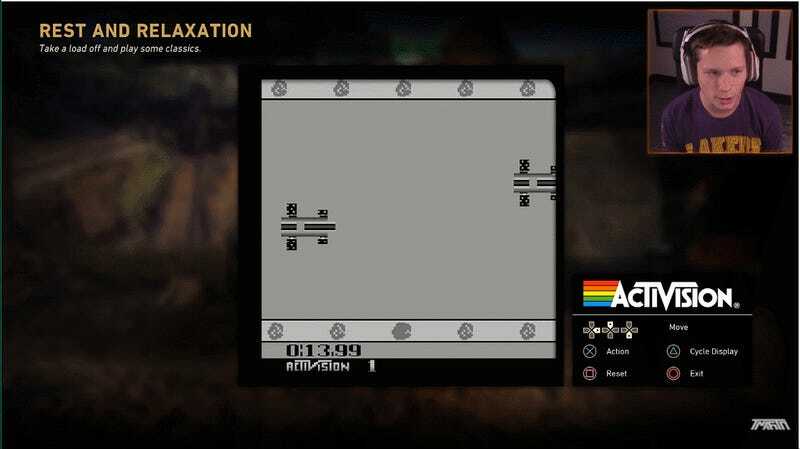 There’s a place in Call of Duty: WWII’s social space where you can play old Activision games from the 80s. It’s a cool easter egg and something that we’ve seen in past Call of Duty games, but some modern Youtube gamers couldn’t decide what to do with them. The R&R station in WWII’s Headquarters is just a make-shift tent around a crate with a chessboard on top. Click on the pieces and a menu opens up where you can purchase up to 15 different retro classics. The way it functions is similar to Animal Crossing on the GameCube where you could unlock NES games like Punch-Out!! and Balloon Fighter, except that the library is filled with games once published by Activision like Boxing, Enduro, and even Spider Fighter. “Games [Activision] has made in the past like Nintendo and before Nintendo,” is actually how HollowPoint described it in recent video tour of the Headquarters. “Some of these, I was probably like a little kid when these were out,” he continues. Then he moves on to the gun smith. Unlike a lot of other people who stopped at the wartime arcade during their video tours, however, Tmartn actually played some of Grand Prix, a simple, side-scrolling racer that probably isn’t much fun. He endured though hoping their might be some reward. “I’m not really sure what the objective is here—holy cow—are we gonna actually get something from playing this or is this just kind of a fun little side thing?” No one has ever worked so hard to make a game of Grand Prix seem so exciting. Rewards were definitely a theme in a lot of the YouTube videos of people first encountering the R&R portion of the Headquarters space. After all, the primary purpose of it is to give you a dedicated zone for opening loot boxes and messing around with your new gear. Why wouldn’t Grand Prix have a loot box at the end of it? Pitfall 2 on my PS4? One of the best platformers of a generation, considered by many to be the Atari’s single best game, all for only 10 credits a play? It’s going to be a great year indeed.